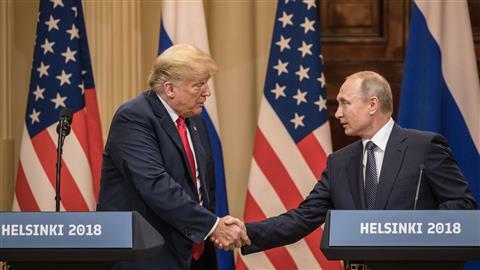 MOSCOW—President Vladimir Putin on Thursday defended Donald Trump from angry criticism following their summit in Helsinki, as the U.S. president called for a second face-to-face meeting with his Russian counterpart. Mr. Putin, in his first comments in days, praised the Helsinki summit and said it led to some “useful promises.” Little more than an hour later, Mr. Trump tweeted that he wanted a follow-up meeting with Mr. Putin to work on the issues he said they discussed, including terrorism, Israeli security, nuclear proliferation and cyberattacks. Mr. Putin, in his speech to ambassadors at the Russian Foreign Ministry, said the two leaders spoke about ensuring the security of the Golan Heights. Without offering details, he also mentioned the need to renew arms treaties, including the nuclear arms reduction treaty New Start. “It is important that a full-fledged meeting took place allowing us to speak directly, and overall it was successful.” Mr. Putin said. In the days after the summit, both the Russian defense and foreign ministries said they were either ready to begin or already had started working on agreements hashed out between the two leaders, but neither offered any details as to what they were. The Russian Ambassador to the U.S. Anatoly Antonov, speaking to Russian media, said earlier in the week that a number of oral promises had been made between the two leaders. Mr. Putin used the speech to praise the summit as well as to pour cold water on the onslaught of criticism Mr. Trump has faced from both Democrats and his own party for comments casting doubt on the U.S. intelligence community’s accusation that Russia meddled in the 2016 presidential elections. The Kremlin leader, who has repeatedly denied that Russia was involved at a state level in interfering in the 2016 presidential election, said the agreements made were more important than recent criticisms and accused Mr. Trump’s detractors of playing politics. “We spoke about ensuring security on the Golan Heights during the course of the operation in Syria. Judging by everything, this doesn’t really interest anyone.” he said. He also spoke about Russian and U.S. nuclear arsenals, a reason Mr. Trump himself has given for holding the summit. Mr. Putin said work was needed on new arms controls treaties, including the New Start nuclear reduction treaty which is due to expire in the coming years. “If today, right now, work is not started on its continuation, its prolongation, then it will end in a year and a half. It will be no more,” he said. “We see that in the United States there are forces, which with ease are ready to sacrifice the U.S.-Russian relationship, sacrifice their own ambition, in the course of domestic political struggle in America,” he said. He didn’t comment on Mr. Trump’s subsequent comments saying he misspoke at the joint news conference where the two leaders appeared cordially side-by-side.